Chonilla is a portmanteau of Chocolate & Vanilla! Hosted by @Sherasaurus 'CHO' & @Clovasaurus 'NILLA' who chronicle their lives as a woke personal comedy journal from a black woman and white man perspective.
" We keep seeking the funny, while we discuss many topics from being in an interracial relationship, rearing bi-cultural kids, explore the journey of parenting, talk about racism, religion with the ever popular and original segment 'Bible Scriptures 90210', current events and more. Our goal is to create a diverse podcast network of like minded content in different genre that our listeners can enjoy, and participate. " We are very opinionated, yet open and love sharing our unique experiences from polar opposite perspectives. We definitely cross the line of sharing too much information at times, but our audience love it, these awkward moments create magic and we've made long term friends from the support of our listeners. Interactive & Dynamic Live shows via Facebook Live & YouTube. We celebrate Interracial and Interfaith Love. Recording a podcast full-time is a dream for us both, but it ain't cheap. We research, book show guests, record, and edit audio, prepare marketing campaigns, hook-up perks constantly while having a job in video games or run a freelance biz, so that our listeners (aka Chonillians!) can enjoy a high quality audio experience every time they choose to tune in. 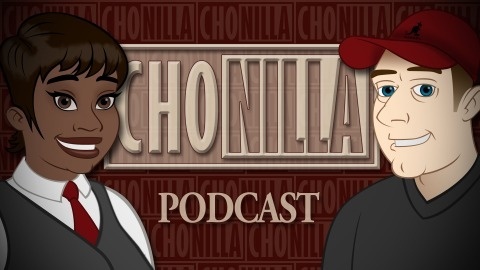 With your support, we'll be able to cover the hosting costs associated with making this show, and grow "The Chonilla Network" with talented content creators, from fellow podcasters including video casters & bloggers. As our Patron, you'll will be able to choose your level of access to the many premium episodes within our podcasting network. That's over 500 hours of quality content that you will be able to enjoy at your leisure, and with our multiple avenues of personal contact (one on one skype for example), you will be able to communicate to us directly on how you feel about the topics we cover and gifts galore. Start pledging now, get mentioned on the show, and join the conversation with long term listeners who are smart, fun, and engaged. Welcome to the Chonilla Love! Thanks for your support! Every bit counts, getting us closer to each milestone! Your donation will go towards the podcast and hosting fees, and the eventual purchase of better/new recording equipment. Full access to Regular content across entire network including premium audio shows. Full Access to Regular and Extended content. Private Hangout (Ask us anything!) + a Chonilla T-Shirt! Episode Sponsorship! We'll tell our listeners about your awesomeness! Enjoy all the Network shows from your mobile device.